1340/1345?-1400, author of Canterbury Tales, a collection of five stories filled with comments concerning 14th C. English food especially in the Nun’s Tale and the Miller’s Tale. Until Shakespeare, this was the most important work in England. Although he appeared two centuries later, Chaucer’s counterpart in Spain was Miguel Cervantes, author of Don Quixote. 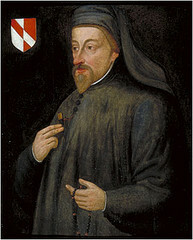 Chaucer entered the service of Edward III and became his ambassador to several European countries. He continued in this capacity under Richard II. Chaucer married Philippa Roet, lady-in-waiting Edward III’s wife, Queen Philippa and later, lady-in-waiting to Constance of Castile, daughter of Peter I of Castile and second wife of John of Gaunt, Duke of Lancaster an second son of Edward III. Philippa Roet became Gaunt’s sister-in-law upon his third marriage to Catherine Roet Swyneford, her sister. Philippa Roet and Chaucer had two sons and two daughters. The most known was Thomas, the eldest. His only child was Alice Chaucer, Duchess of Suffolk. She was an important courtesan during the times of Henry VI of Lancaster and personal friend of Margaret Anjou, his wife. John, her only child, married Elisabeth York, Edward IV’s oldest sister. In Canterbury Tales, Chaucer uses food to reveal traits and personalities of his characters. The poor widow in “The Nun’s Tale” ate brown bread and drank no wine while the prioress only gave fine white bread to her dog. The franklin’s wealth is revealed by quantity of food on his table. The cook prepared blancmange and mortreux but at the same time sold stale pastries with flies in them. Chaucer also used food to introduce humor. 28. Blawmanger. Tak the two del of rys, the thridde pert of almoundes; wash clene the rys in leuk water and turne and seth hem til thay breke and lat it kele, and tak the melk and do it to the rys and boyle hem togedere and do therto whit gres and braun of hennes grounde smale, and stere it wel, and salte it and dresch it in disches. and frye almaundes in fresch gres til they be browne, and set hem in the dissches, and strawe theron sugre and serue it forth. Place 1¼ c almonds in boiling water for a few minutes. Stain off the water and peel them. Grind 1 c in a mortar and set aside. Fry the remainder of the almonds in olive oil and cut in half or in slivers. Set them aside for garnish. Boil the chicken in chicken broth until the meat falls apart (about 20 minutes). Remove the chicken from the broth and soak the almonds in the chicken broth overnight. The next day, shred the meat from the chicken breast. Strain the broth with ground almonds through a cheesecloth into a pot to make almond milk. Bring the almond milk to a boil and add the rice. Add salt to taste. Reduce heat, stir in chicken, and cover. Cook, stirring occasionally, until liquid is absorbed and rice is fluffy. Place this in a serving dish. 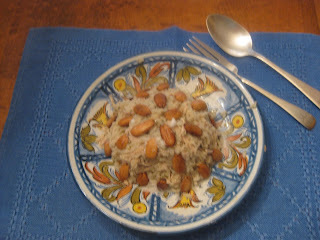 Garnish with almonds and a sprinkle with sugar. 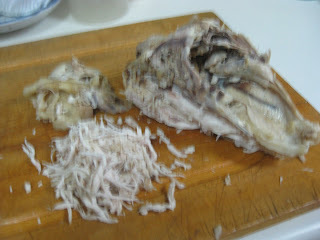 See blogs titled azumbre, cangrejo, cetrería, color and cuasimedio for a Spanish versions of blancmange. It is interesting to note that the 14th centurySpanish version does contains rice flour as per the Sent Soví recipe published November 26, 2011in the blog titled cetrería. For the English rice was a luxury item. As this is a bland dish, often recommended for the sick, it is recommended to add herbs and/or spices to taste. The Peruvian dish of “pollo al aji,” is a modernized version of blancmange with the addition of the New World products, the pepper and the potato and the elimination of almonds.